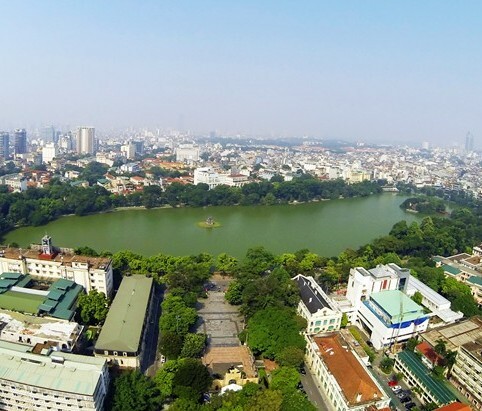 Hoan Kiem Lake is the most special symbol of Hanoi city, with the notable legend of King Le Thai To returning sword to God of Turtle in 15th century. 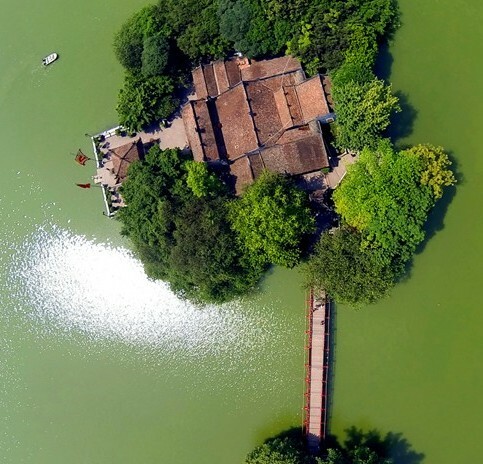 These pictures taken from the high view by fly-cam will bring an outstanding view of this symbolic lake. 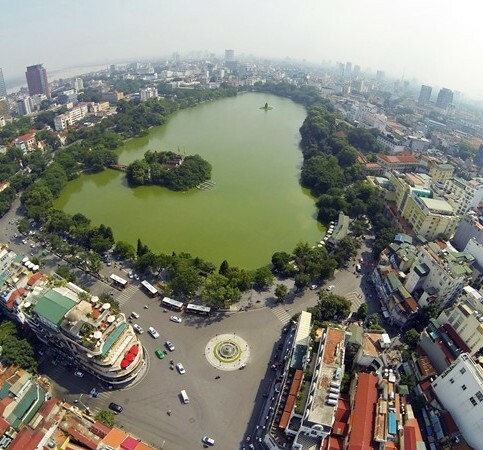 Hoan Kiem Lake (or Guom Lake) is located in the centre of Hanoi, nearby the Old Quarter built by French a century ago. 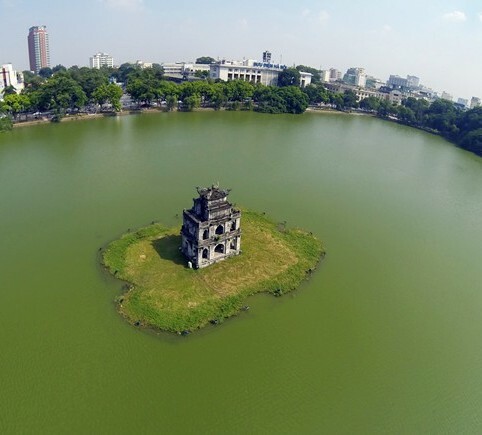 Situated in the centre of the lake is a tower called Thap Rua (turtle tower) which was built between 1884 and 1886. The tower has 3 storeys and one top, including 4 sides with the combination of Gothic architecture and Vietnam’s traditional architecture. It was originally used by King Le Thanh Tong to fishing in his free time. This is Ngoc Son Islet featured by famus Ngoc Son Temple. You can see The Huc Bridge in beautiful red. Ngoc Son Islet is located in the north of the lake with the original name of Tuong Nhi (means Elephant’s Ear). Ngoc Son Temple is highlighted with the typical architecture of Vietnam’s Buddhism style. The location of the temple right on the lake creates a special attractive and shows the harmony between people and nature. 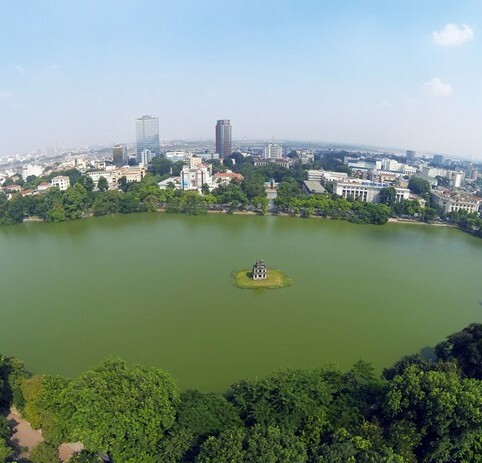 The total area of Hoan Kiem Lake is 12ha. It had various names before changing into Hoan Kiem (or Guom) to imply the legend of returning the sword after the war happening on the lake. 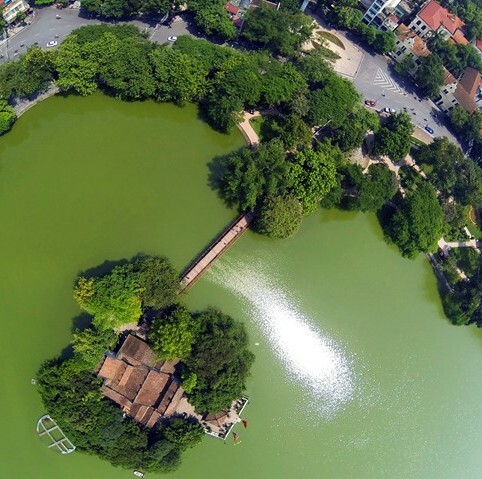 The surrounding area around the lake is now becoming cultural and entertaining center of Hanoi. It is also a must-come destination when traveling Hanoi.